From the sound of things, Stephen King is about to enter what could well be one of the busiest stages of his professional life. Ghost Brothers of Darkland County. A new novel, Joyland, will be published by Hard Case Crime next month. King’s sequel to 1977’s The Shining, Doctor Sleep, will be out in September. A much talked about television miniseries based on his 2009 novel Under the Dome will premiere on CBS June 24th starring Mike Vogel (Pan Am, Clovefield), Dean Norris (Breaking Bad), and Rachelle Lefevre (A Gifted Man). 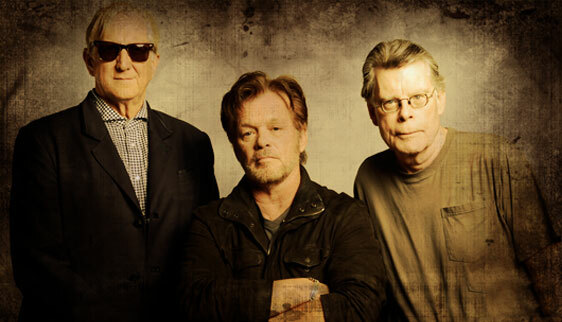 Plus his musical-theater collaboration with T-Bone Burnett and John Mellencamp, Ghost Brothers of Darkland County, opened last month in Atlanta and will begin a US tour in the autumn. Meanwhile, a companion album featuring Elvis Costello, Sheryl Crow, Roseanne Cash, Taj Mahal and others will be released June 4th. No, absolutely not. I think it’s because they’re so screen-oriented [TVs, computers, smartphones]. They do read — girls in particular read a lot. They have a tendency to go toward the paranormal, romances, Twilight and stuff like that. And then it starts to taper off because other things take precedence, like the Kardashian sisters. I did a couple of writing seminars in Canada last year with high school kids. These were the bright kids, Ken; they all have computers, but they can’t spell. Because spell-check won’t [help] you if you don’t know through from threw. I told them, “If you can read in the 21st century, you own the world.” Because you learn to write from reading. But there are so many other byways for the consciousness to go down now; it makes me uneasy. The new Kate Atkinson, Life After Life, is a terrific read. And I go back to Agatha Christie in the summertime; I love those. There’s also a hard-boiled mystery called Gun Machine [by Warren Ellis]. Of course, I have to mention my son Owen’s new novel, Double Feature, which is very, very funny, and it’s a bighearted book. And my son Joe [who writes under the name Joe Hill] has a new [vampire] book out called NOS4A2. It pulls you in and keeps you in. He is so right. Unfortunately, even if these girls do continue to read into their teens and young twenties, it will primarily be tabloid magazines, etc. Even more worrying are children who are incorporating "net speak" into their writing! My cousin has second graders who are spelling "you" as "u" and "two" as "2." It's very worrying to see the way technology is impacting our youth right down to some of the most fundamental of skills. Young people, old people, boys and girls will all read what they find relevant to their lives. The challenge is to let them know what's out there that meets that criterion.